Carl "The Truth" Williams, one of a core of solid heavyweight contenders in the 1980s, died Sunday of complications from throat cancer at 53, according to the New York Daily News. Williams, who finished his career 30-10 with 21 knockouts, lost heavyweight title bouts to Larry Holmes by decision in 1985 and to Mike Tyson by first-round knockout in 1989. 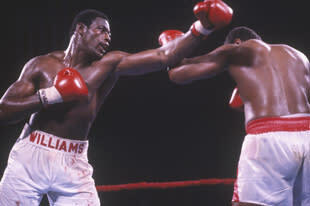 Williams fought a veritable who's who of the world's best heavyweights during his era, defeating Trevor Berbick, Bert Cooper, Jesse Ferguson and James Tillis and losing to Tyson, Holmes, Tim Witherspoon, Mike Weaver, Tommy Morrison and Frank Bruno. Williams was a skilled fighter who fought in a quality era. Randy Gordon, the former chairman of the New York State Athletic Commission, told journalist Lyle Fitzsimmons that Williams would have been a legitimate contender in the current heavyweight divisions. To me he was a fighter who came along at the wrong time, right between Larry Holmes and Mike Tyson. I have no doubt that if Williams were fighting today he'd be the one guy capable of upsetting the Klitschko brothers and certainly capable of teaching the rest of the division how a heavyweight should use the jab. The peak of his career probably came in 1985, when he met Holmes in Reno. Holmes entered the bout 47-0 and had held the title since 1978. He was nearing one of boxing's most sacred records and was attempting to match Rocky Marciano's 49-0 career mark. Holmes needed two more wins to tie it, and took on the then-25-year-old Williams in bout 48. Williams was just 16-0 and little known at the time, but his jab and athleticism kept him in the fight. He lost a disputed decision, with Holmes taking it by scores of 143-142 and 146-139 twice. After a loss to Weaver, he won five in a row to earn a bout with Tyson. He was hit with a vicious left hook and referee Randy Neumann opted to stop it. Tyson was 36-0 at the time and was at or close to his devastating peak. Williams and trainer Carmen Graziano complained about the stoppage, recounted Bernard Fernandez in The Sweet Science, and said it was made because of Tyson's reputation, not because Williams was too hurt to continue. Graziano, in particular, was insistent it was too quick. 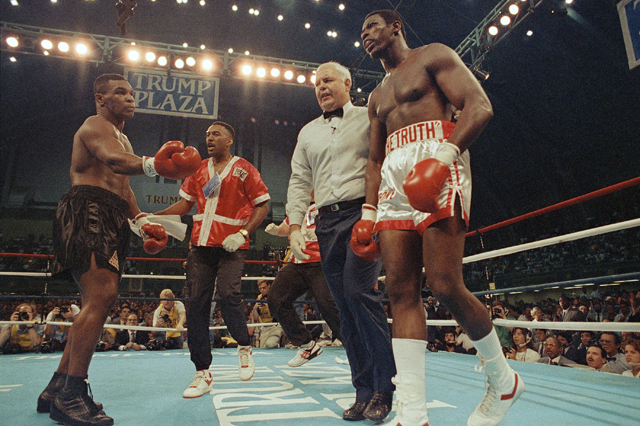 When Mike Tyson knocks somebody down, some referees are more inclined to stop a fight just because he’s Mike Tyson. After the bout, Tyson heaped praise on Williams for being aggressive and competing. Williams was not intimidated and tried to win, earning Tyson's admiration. I have great admiration for him. That's how you should fight when you fight for the heavyweight championship of the world. You should try to take it. Don't run around the ring and pitty-pat for it. Williams is survived by two children, a son, Daniel; and a daughter, Carla.